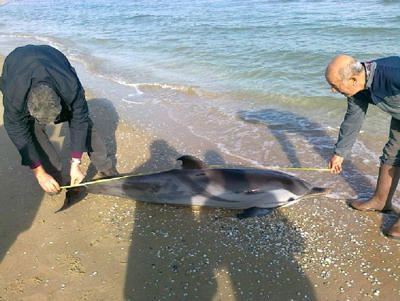 On 19 January 2012, the presence of a beached dolphin was reported to the Cetacean Research Centre, coordinated by Dr. Vincenzo Olivieri, by Istituto G. Caporale staff working at the Torre del Cerrano (Pineto). The dead animal was identified as a female striped dolphin (Stenella coeruleoalba; Meyen, 1833), not commonly found in the northern Adriatic. It was in a good state of preservation (CODE 2) and without any external signs of injury or trauma. The newly established IZS national beached cetacean network immediately sprang into action. 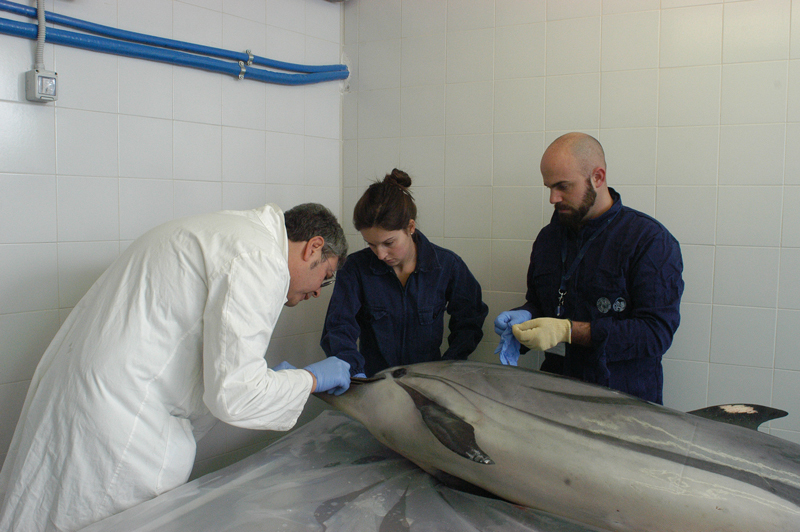 Dr. Sandro Mazzariol of the Padua University's Faculty of Veterinary Medicine, appointed by the Ministry of Health to train IZS staff in cetacean post-mortems, was involved straightaway, as required by procedure. Dr. Mazzariol carried out the post-mortem the next day, 20 January 2012, in the Istituto G. Caporale's central laboratory in Teramo. This was a particularly important training opportunity, given the rarity with which these mammals are found. 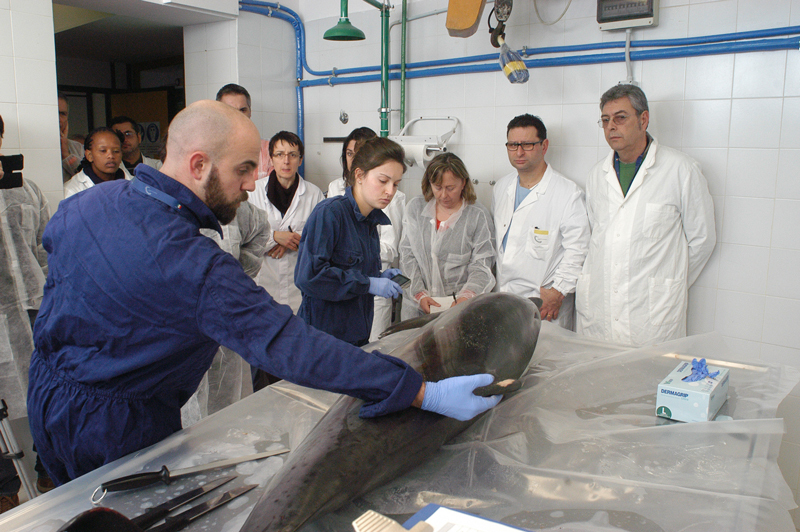 Representatives from the Cetacean Study Centre, University of Teramo and the Institute itself took full advantage by attending the post-mortem. As with another specimen of the same species beached at Porto Garibaldi (Comacchio, Ferrara) less than a week earlier, the cause of death was found to be a massive build-up of nematode worms in the digestive system, causing ulcerative lesions. A mass of these worms was also obstructing the opening between the forestomach and the glandular stomach. This obstruction was held in place by a large piece of plastic bag, thus further complicating the situation. Evidence of such a severe parasitic infestation is not a common finding, and it was thus decided to conduct a parasitological investigation to identify the species involved. The worms were found to be of the Anisakidae family. The dolphin was found to be lactating, leading to the supposition that there was an as-yet non-self-sufficient baby still at sea. Numerous organ and tissue samples were harvested for chemical and biological investigation, and are available for study to any interested research groups. This episode demonstrates the efficiency of the newly created IZS beached cetacean network: just four hours passed between finding the dolphin and its transport to the laboratory, and the post-mortem was conducted within 24 hours of the find by experts coming from over 600 km away. This was the first example in Abruzzo of the coordinated action of various facilities (Istituto G. Caporale, Cetacean Research Centre, University of Padua, University of Teramo, Veterinary Services, Coast Guard, and the Marine Protected Area), each acting in its own area of expertise. It provided an opportunity to standardise procedures and share and increase scientific research and knowledge in order to improve initiatives for the protection of cetaceans.